While in the TideSmart Talk with Stevoe studios, Alan Caron, creator of Envision Maine, discussed his career, including how he became the first high school dropout to be admitted to a mid-career Master’s degree program at at Harvard University’s Kennedy School of Government. 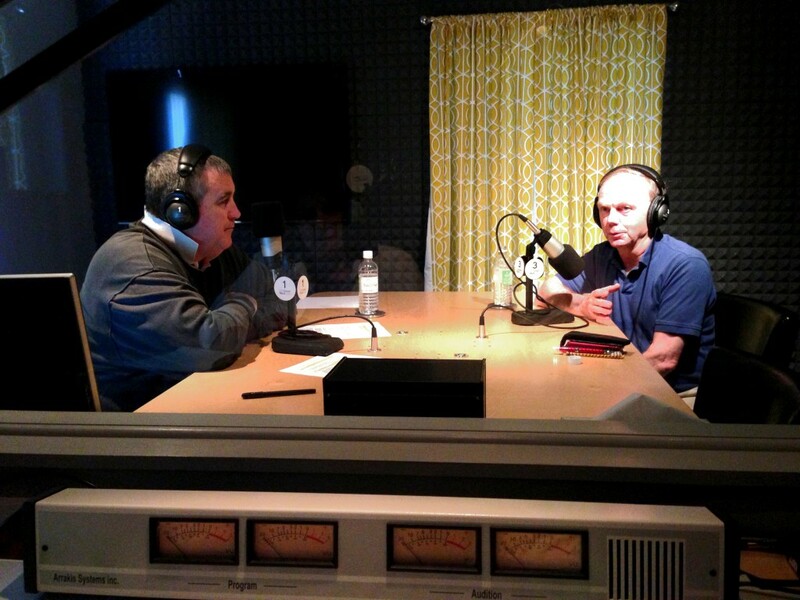 TideSmart Talk with Stevoe host Steve Woods (left) welcomed Creator of Envision Maine Alan Caron (right) to the Falmouth studio. In 2002, Caron created a new statewide organization, GrowSmart Maine. This organization was started with the hopes for a stronger economy and for the protection of the state’s natural and historic character. From 2003-2009 Caron served as President of GrowSmart Maine, which was then based in Yarmouth. During Caron’s time with GrowSmart, he helped to raise funds to bring the Brookings Institution to Maine for a major study of the state’s economy and environment. This 2006 study, entitled “Charting Maine’s Future: An Action Plan for Promoting Sustainable Prosperity and Quality Places”, discusses how Maine is changing, the challenges and opportunities we face, and offered a ‘Blueprint for Action’ for growing Maine in the 21st century. “Charting Maine’s Future” is now widely regarded as a framework for current and future change in Maine. 2009 brought the start of Envision Maine, “The Independent Think Tank for Maine.” The primary interest of Envision Maine is to move Maine toward a more sustainable and vibrant economy. Caron estimates that over the next 3-6 months Envision Maine will really ramp up its activity and start leading Mainers toward a shared vision of our future. In 2010, Caron published “Reinventing Maine Government”. This report compares Maine to the rest of the nation and looks at what Maine can do over the next 10 years to replace its inefficient government with new, more streamlined operations. Caron also is a contributing columnist to the Portland Press Herald. His interests include history, golf, gardening, canoeing, sailing and flying. Posted on Wednesday, May 8th, 2013 and filed under Show Recaps.